Hello, to all my ribbon-loving blog friends. Thanks for stopping by today for the Really Reasonable Ribbon June Blog Hop. 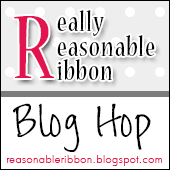 You should have arrived here at my blog by way of Bonnie's Blog, but if you didn't....there's still time to get started right here on the Really Reasonable Ribbon Blog. There's also a question at the end of hop, so don't forget that either. 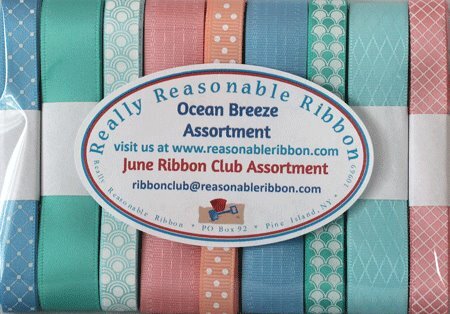 Take a look at this month's GORGEOUS Ribbon Club Assortment. 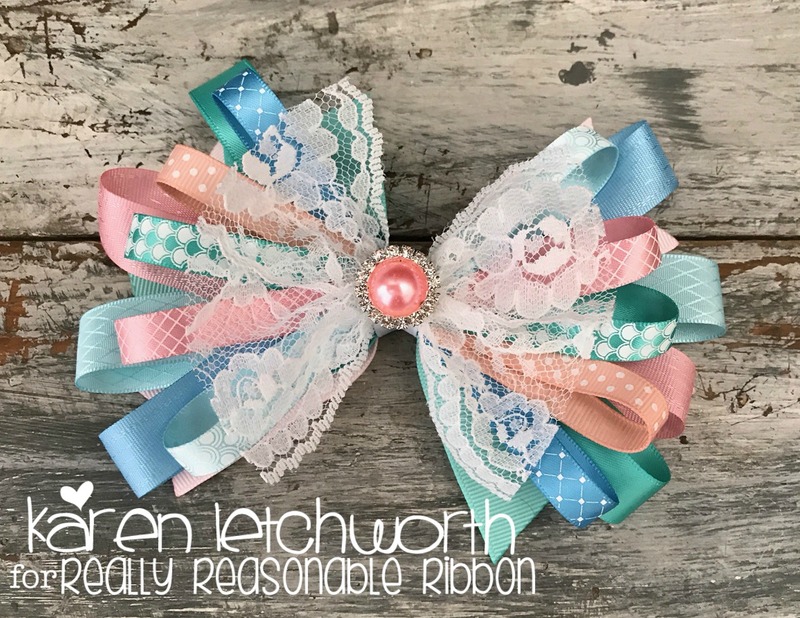 As I always like to do, I was able to showcase ALL the lovely ribbons from this month's Ribbon Club Assortment by sharing a hair bow. It's nice to use them ALL because they're so pretty. There's a length of each including the 3/8" Diamonds and Dots on Copen Blue Satin, 5/8" Tropical Double-Faced Satin, 3/8" Concentric Circles on Ocean Blue Satin, 5/8" Peony Delicate Stitched Satin Ribbon, 3/8" RRR Select Swiss Dots on Moonstone Ribbon, 5/8" Copen Blue Delicate Stitched Satin Ribbon, 3/8" Fancy Shell Print on Tropical Satin Ribbon, 5/8" Ocean Blue Diamond Satin Ribbon, and last but not least by any means, the lovely 3/8" Crosshatch Ribbon on Peony Satin. Gorgeous! There's a piece of white lace on the top of my bow; and Really Reasonable Ribbon carries a wide variety of Lace. There's also a fun little Rhinestone Embellishment in the center of my hair bow, and Really Reasonable Ribbon carries LOTS of great Embellishments as well. Your next stop on the blog hop is at the blog of my talented teammate, Kathy, and I know she will have something wonderful ready for you all. Thanks so much for joining us on this month's Blog Hop, and don't forget to answer the question at the end of the hop so that you'll be entered to win this month's FABULOUS Ribbon Club Assortment. We're always happy to have you join us. Simon Says Stamp Monday Challenge - Simon Says "Touchy Feely" - All these fabulous ribbons give you a great load of texture to touch and feel. What a pretty hair bow Karen. Perfect for any summer occasion. I totally want to attach this to a gift! So pretty and vintage looking! Very pretty bow. 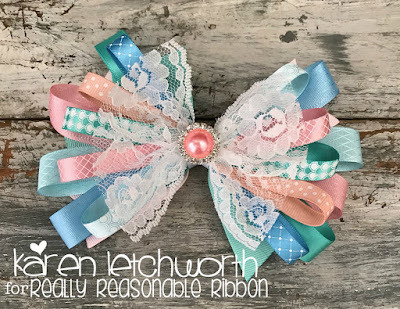 The rhinestone embellishment is perfect with these ribbons. Gorgeous, Karen! 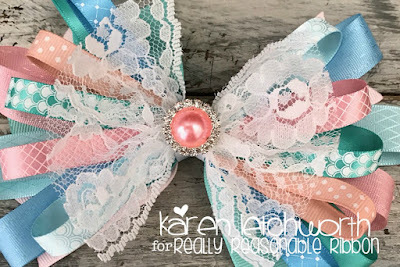 I really like the addition of lace to the center of this pretty hair bow! How beautiful! I know my niece, Mary Grace would love to wear something like this. Love the pretty colors in this gorgeous ribbon assortment. This is just the best bow ever, Karen. I love the addition of lace! Beautiful addition of lace and that tiny rhinestone to the center! So pretty! Beautiful hair bow, love the ribbon colors and the rhinestone embellishment! Adding the lace really increases the feminine aspect of this bow. Nice colors! Love the Hairbow. Would be perfect for some of my friends grandchildren . Gorgeous! I really need to make this! 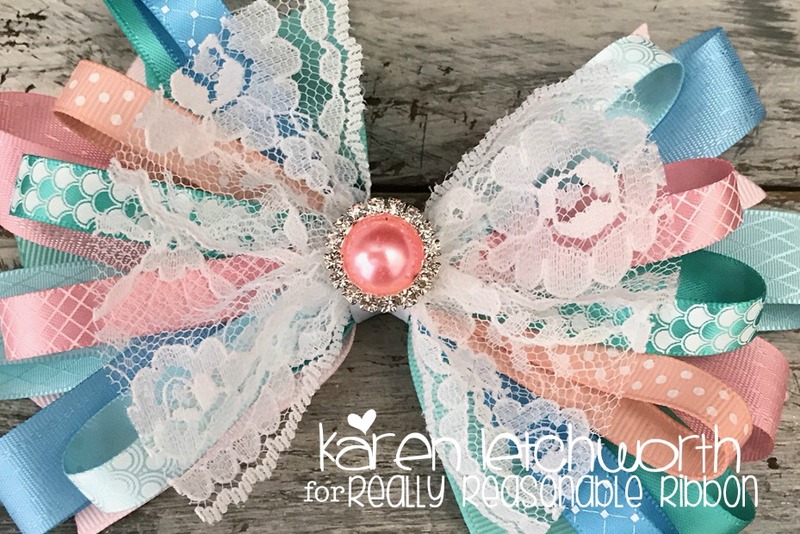 Pretty color combo for your bow! this is a cute bow! !Thanks for sharing!!! What a fabulous bow, Karen. You are such a rock star with the ribbons. A gorgeous selection of ribbons Karen, and a beautiful hair accessory. This is too cute. Love the way you used this month's ribbon to create something other than a card or scrapbook page. This hair bow is exquisite. . .what little girl wouldn't want to wear it!? These ribbons are just so lovely. Thanks for sharing a great way to showcase how well they work together.